Not surprising given that the NRA is nothing more than controlled opposition which has shown its support of gun confiscation laws a.k.a red flag laws. The incestous relationship between NRA and Akerman and McQueen has been exposed. It looks like NRA was depending on NRA Carry Guard to help erase the financial deficit it is in, but New York Governor Cuomo stopped that shoddy insurance product from being sold there. The NRA annual convention is coming up soon should be interesting if Wayne Lapierre and Chris Cox ignore the elephant in the room and how many Fudds continue to be duped by thieves in charge. NIGEL Farage has vowed his new Brexit Party will destroy the establishment, raging the UK’s two-party system “doesn’t work” because they serve “nothing but their own interests and agenda”. 4/20 1941. 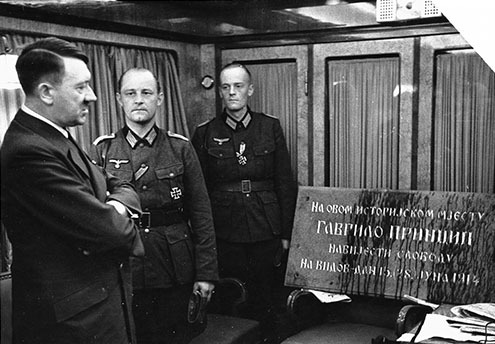 German soldiers gave birthday present from Sarajevo to their Furher Adolf Hitler: commemorative plaque for heroism Gavrilo Princip in 1914. Unfortunately, Hitler's birthday in the small town of Pancevo near Belgrade, Serbs and Jews was paid in blood in the following days.